Our first priority is to assist families and property owners who require our services. We truly care for the customers we serve, and we’ll be by your side even following the cleanup. From our support network to our dedicated staff, we provide more assistance than anyone in the industry. If you are paying with insurance, our standard service includes full detailed documentation and photography. We'll even work directly with your insurance company if you prefer. HOW MUCH DOES CRIME SCENE CLEANUP COST? 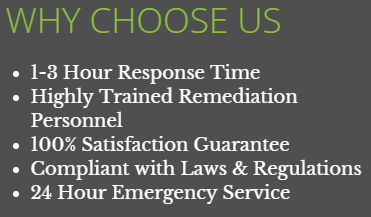 The cost of remediating biohazards can vary dramatically from situation to situation, so we are not able to provide phone estimates without doing a proper assessment. Keep in mind that even providing a thorough walk thru assessment, our work IS exploratory. Meaning, we cannot see what, if any contaminants are under the surface. When you call us, we'll immediately come to the scene and prepare a detailed scope of work and a written estimate of our recommended treatment plan. Our hourly rates are industry standard with Blue Book and Xactimate, which are insurance industry pricing tools. Our normal practice is to staff all job sites with a minimum of one foreman and one technician for safety reasons as well as efficiency. Pricing factors can include: the number of rooms affected (including pathways used by body transporters or law enforcement), level of structural damage (floors, sub-flooring, wall surfaces, cabinetry), length of time left unattended, additional complications such as hoarding, machinery, or large amounts of personal property such as furniture and clothing. If you are paying with insurance, your carrier may not cover the costs of personal property so we will provide a separate estimate for cleaning and/or removal. DOES INSURANCE COVER CRIME SCENE CLEANUP? Every loss is unique and while we cannot make any guarantees regarding your coverage, in most cases, homeowners insurance does cover our services. If you have coverage, we will submit the bill to your carrier and work with them directly to resolve payment. You will only be responsible for your deductible. We can estimate your out-of-pocket expenses after reviewing the site and getting an assessment of the work needed. Please allow up to 45 minutes for response time, if this is an emergency situation, please call our main phone number.